One thing I really like about NZXT and their whole H-series lineup is the fact they kept the same visual elements across the line. If you have or have not read through the H700i, I would suggest you flip between the two reviews to see how similar the two cases are. Personally, I think the whole lineup is one of the cleanest yet classiest looking cases I have seen in a very long time. One could call it understated, especially with its straight edges and overall rectangular shape. However, I would smack anyone who calls this boring, especially if you get the case with any two-tone color scheme. We received the Matte Black + Red version, but Matte White, Matte Black, and Matte Black + Blue are also available. The edges may be straight, but the contrasting colors and textures really spark some life into the chassis. Otherwise, I think this design really scales down well to the smaller size and the H200i is a stunning one. The front panel is a flat piece of matte black steel consistent with its design theme. A mesh opening can be found down the front edge of the left and right panel to allow for airflow. The left panel is a piece of tinted tempered glass, while the right side uses a standard steel panel. As you can see, NZXT has placed a caution sticker because of this more fragile and heavy panel, but I will point out this sticker is actually just a plastic seal and can easily be peeled off and placed elsewhere without leaving any residue. 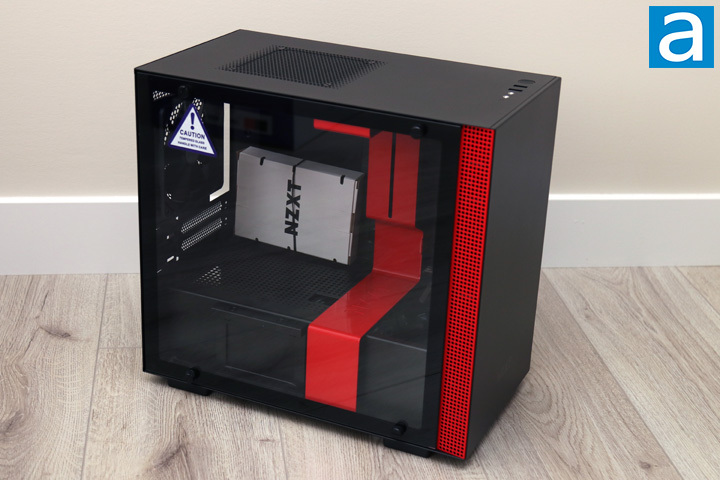 Otherwise, the NZXT H200i is classified as a mini ITX tower case, with dimensions of 210mm in width, 349mm in height, and 372mm in depth. While this is much shorter than most standard ATX cases, you can see they have not skimped out on the width of the case, which hopefully will result in ample component compatibility and cabling, but we will see soon enough. 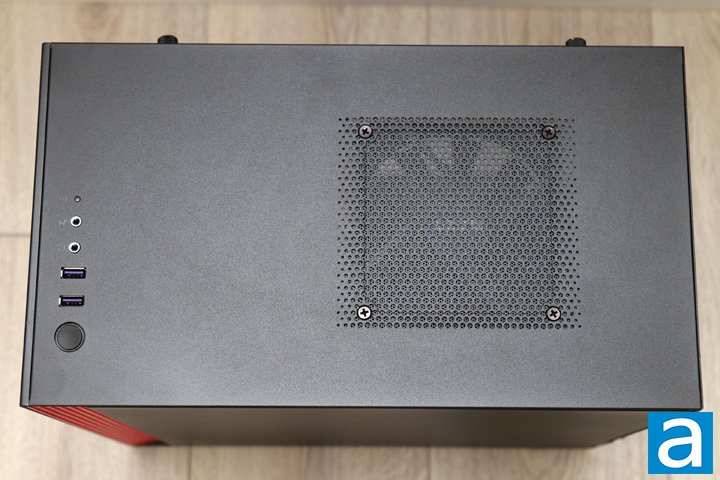 The case utilizes steel and tempered glass all around, making it a pretty hefty one at 6.0kg. While this is still lighter than most cases we see today, it is denser with its smaller footprint. Build quality overall is excellent with the steel construction feeling quite sturdy. On the top panel, we have the typical inputs and outputs you have come to expect on most cases. Starting from the top of the image, we have a hard drive activity light, followed by the microphone and headphone audio jacks. Next to these, we have two USB 3.0 ports and an illuminated power switch. The power switch is a click switch and the surrounding power light is white in color. Unfortunately, we are missing out on any USB Type-C connection here, which was also the case with the larger H700i. Even so, I still would want to see the reversible port included, as this is 2018 and many new motherboards come with the internal headers for this connection. 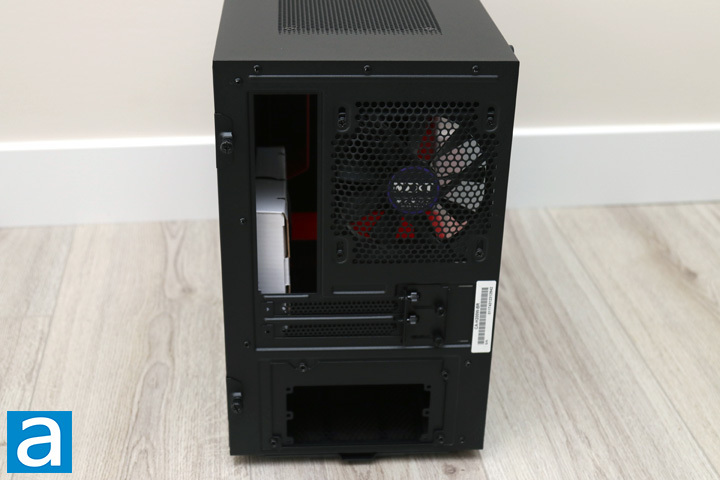 Otherwise, the top panel also shows off the opening for a 120mm fan here and NZXT has included a "case-version" of the Aer F120 fan here, though it is not exactly the same as the retail fan we previously reviewed, as we will see shortly. This is mounted with a mesh cover in between the case and the fan to prevent larger dust particles from entering here. Only 120mm fans or radiators are supported here, which is a bit questionable, considering the similarly sized Fractal Design Define Nano S had no issues supporting larger radiators at the top. From the back, you can see we have a typical design here. The layout is about as you would expect with the motherboard and exhaust openings on the top of the back. Underneath, we have two slots open for any expansion cards you may have. The expansion slots are held on with thumbscrews and a metal plate to reinforce the card and reduce the amount of sag you may see, though there is another feature to help in this regard. Finally, at the bottom is the opening for the power supply. One interesting thing NZXT has included with the H200i is actually a bracket that allows you to mount either SFX or ATX sized power supplies. As someone who works with a mini ITX system all the time, it truly is appreciated to see support for both smaller and larger power supplies. You probably already noticed the different scenery with this shot, because I accidentally forgot to take the bottom facing shot initially. As you can see however, there is not a whole lot more interesting to this area. On the four corners, we have rubber feet in each to lift the case off the ground while keeping it in place. On the left side, you can see a large sliding power supply filter with a fine mesh to prevent air from entering the power supply. At the front, there are some marked rails. 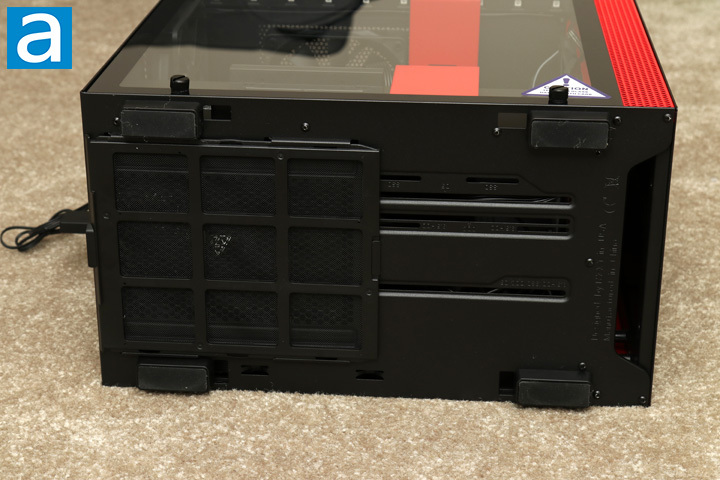 Despite it not being clear in the photo, this area is actually marked for SSD or HDD mounts, which allows users to mount drives on the inside of the case, as we will see later on. Finally, at the front we have an opening to allow air to pass in from the bottom. posted 2 hours and 5 minutes ago, with 5 posts. posted 2 hours and 28 minutes ago, with 4 posts. posted 7 hours and 56 minutes ago, with 4 posts. posted 15 hours and 11 minutes ago, with 9 posts. posted 15 hours and 15 minutes ago, with 11 posts. posted 15 hours and 16 minutes ago, with 56 posts.